After a dozen workshops with young people from Marseille, Nice and Toulon, the Citizens ' Day of April 14th promises to be rich in events! 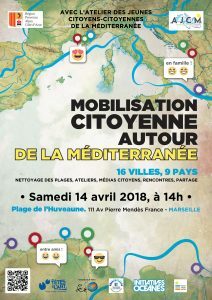 Find the young people of the Assembly of young citizens of the Mediterranean, the regional parliament of the youth, the United City, the Foyer of young workers of Toulon, the Association of solidarity and sustainable movement, Léo Lagrange and many others. This civic event will be coordinated in 16 cities around the Mediterranean.